It is a strong and powerful fleet Admiral! Yesterday marked the end of construction, over 12 months of planning and building I can happily say. "What's next?" Alclad painted main sensor dish. Gold titanium, dark aluminum and duraluminum. Brass spire was gloss coated and fed a .75mm fiber optic. This was an excellent redesign of this area. Really superb. This is the biggest difference between the two designs. The shape of where the upper forward secondary hull meets the lower primary I'm gonna modify mine to how you have it. Nice. Now the oval deflector/sensor dish, grill and profile of the cutout on Sentinel much more aesthetically pleasing than on mine (brilliant), but this is where purpose wins over looks. You probably noted that the on the Aurora the deflector/sensor assembly looks like a separate detachable unit. This was to allow Star Fleet to more easily tailor this ship class to mission specific configurations by use of "quick change" components and modules. Yes the dreaded "pods". I really dislike pod additions on starships but as I'll go into later they were a necessary evil in the Star Fleet Battles universe/timeline. So as starship designer I had to design around this requirement. "Keep your sword bright and your intention true"
Last edited by Lord_Schtupp; 01-12-2018 at 07:27 AM. Thank you again! I can't wait to see your retro-modification. I understand your reasons for the lower pod but this was really the one area I really wanted to redesign to smoothly blend the lower primary into the secondary while retaining an integrated main sensor dish. The hull has such clean lines that I felt this pod simply went against that. There was another version I have of this angle with the lower photon tubes in a rectagular shroud, forward of the lower sensor. Was that an earlier detail incarnation or later since the red stripe is present? I'm loving these never-before-seen images! Please bring 'em on. I also think I'd love to build an as-designed model of your Aurora. Last edited by AdmiralBuck; 01-13-2018 at 09:51 AM. Was just thinking, do you have any ideas of what these ships would look like post-TMP? Not too much. I think I look at my designs as existing in their era without going through the magic-Aztek-carwash Refit process. 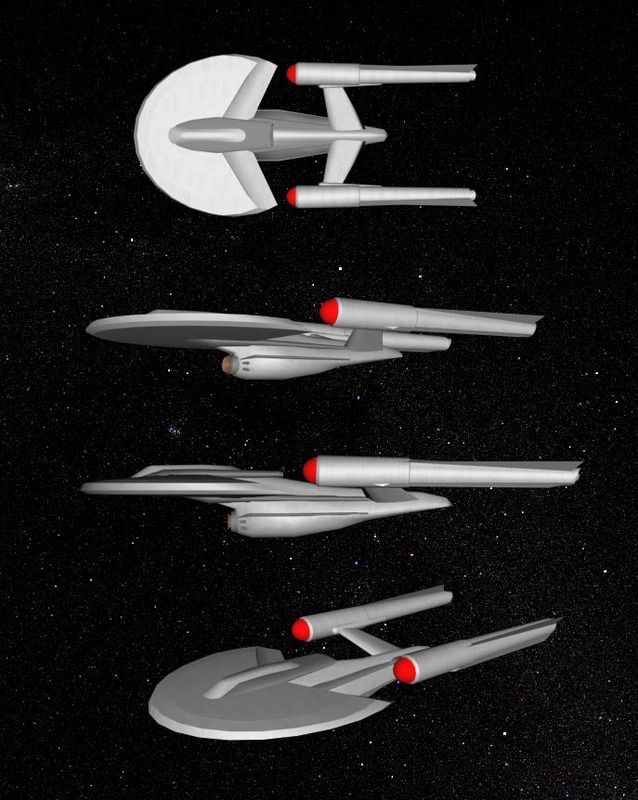 New ships that I'll design and build in the TMP years and later will look the part. I guess I don't want to follow the singular trope of the Enterprise refit process but rather create all-new craft when I can. That's cool! Certainly means always new ships, and we all love that. So, very early renders circa 2001- this model pretty much ended right here. The goal here was to design a ship comfortable operating in an aerodynamic and hydrodynamic environments as well as in space. Features swept forward warp pylons, aerodynamic spade-shaped primary hull, secondary hull torpedo tubes and warp engines ripped off from a '61 Cadillac coupe deville. Looks very much like the Admiral's Shangri-La! Maybe the first flame job on a Starship you've seen: this artwork is hokey I know but I made this art for a birthday card for my Uncle Richard, who was a biker/mechanic/hot rodder/builder/welder etc. I spent most of my childhood and teen years in his garage building cars, bikes and engines. Learned all the cool stuff from him so I pretty much worshiped the guy. He loved Star Trek and Astronomy. I miss him greatly. These are amazing. And the fact that your Aurora began much like the Shang fits coincidently with my desire to build a TOS precursor for the Shangri-La when I began looking for ideas for Sentinel. Who knew we were of the same mind? Automotive styling cues! Absolutely. My first career was that of A+P aircraft mechanic, and I had a friend that worked for NASA at Edwards AFB on the X29 program so that was the inspiration for the forward swept pylon. Cool but didn't really leave much room for main engineering or the shuttle bay (already tiny). More to come, there are 18 more incremental 3DSMAX files, more blind avenues and scads more renders. Will post when I have the chance! Last edited by Lord_Schtupp; 01-16-2018 at 08:10 AM. Just wondering whether you were influenced by John Byrne's work when designing the Antares? I only ask because your Antares turned out quite different from the one in the Concordance. 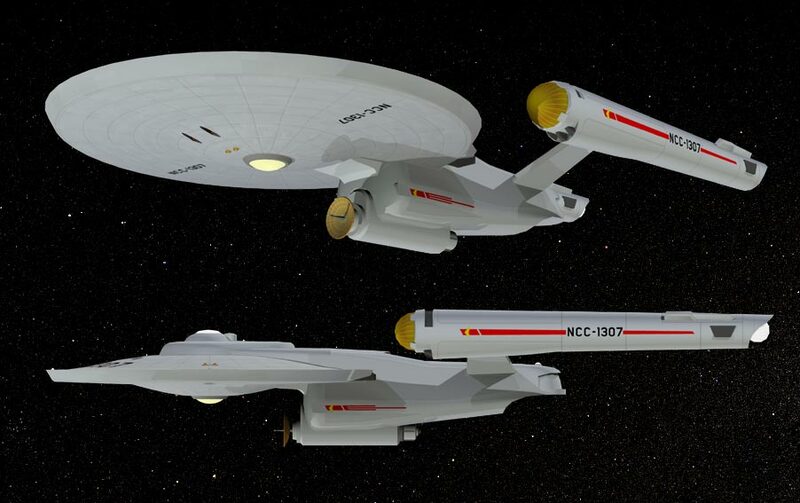 This is a ship he did back in '08, the USS Ventura for the IDW Star Trek comic 'Ghosts'. Last edited by Jim NCC1701A; 01-16-2018 at 06:20 PM. Last edited by Lord_Schtupp; 01-17-2018 at 09:47 AM. Yeah, that would've been me Except for the TrekBBS I've been using that handle since I discovered the forums. I'd forgotten about the Dynaverse... is it still around? Thanks. I'd forgotten that Reverend had done this. You're in luck, I used to save as much ship design artwork as I could find. Oh yes! The Antares is a fantastic design and one that I discovered not too long after I had finished orthographics of the Sentinel. Good Lord, how long has that Antares design been around? I seem to recall building a physical model of that countless years (decades?) ago. I still have it, in pieces.